I love watching my cat chase his toys almost as much as he loves doing it. Problem is cats get bored long before you get tired of watching them. The Cat's Phantom Mouse Teaser should keep your cat a bit busier. If you've ever let you cat try to catch your fingers under a blanket, the Phantom Mouse Teaser creates the same kind of experience, only you don't have to do anything but watch. The toy operates from a gearless friction drive, operated by three AA batteries. The drive has 4 speeds and it moves the 'mouse' around randomly and unpredictably, just like a mouse moves when cornered by a cat. 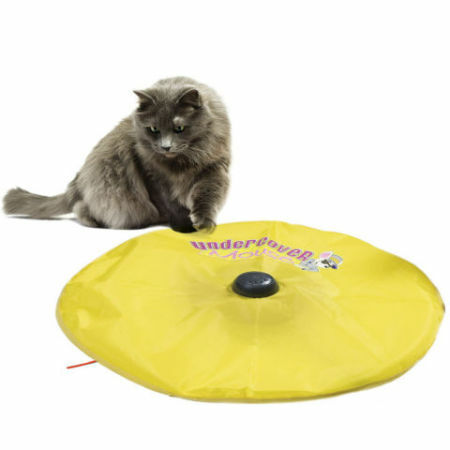 All the while, the mouse tail is circling the rim of the toy taunting your wild one. Go see the Phantom Mouse Teaser on video at Hammacher Schlemmer, where the cat toy is sold with a lifetime guarantee.